German whisky is a distilled beverage produced in Germany made from grains traditionally associated with the production of whisky. The distillation of German-made whisky is a relatively recent phenomenon having only started in the last 30 years. The styles produced resemble those made in Ireland, Scotland and the United States: single malts, blends, and bourbon styles. There is no standard spelling of German whiskies with distilleries using both "whisky" and "whiskey" and one even using "Whesskey", a play on the word whisky and Hesse, the state in which it is produced. There are currently 23 distilleries in Germany producing whisky. The Schlitzer Destillerie in Schlitz (Hesse) produces spirits and liqueurs since 1585 and is the oldest still producing distillery in Germany. In 2013 the 14-year-old Glen Slitisa Single Malt Wheat Whisky was awarded third place at the trade fair InterWhisky in Frankfurt. The Blackwood distillery Seeger in Calw-Holzbronn has been producing whisky using wheat since the 1980s. A 12-year-old filling is planned. The whisky and the fruit brands with which the distillery began is well known in a wider area around southern Germany. In 1980 Robert Fleishmann founded the Blaue Maus Distillery (blue mouse) to produce brandy wine on the site of a grocery and tobacco shop that was owned by his family. He made his first attempt at making whisky, a pure single malt, three years later. After many attempts at perfecting the art he sold his first whisky in 1996 and four years later his son Thomas and wife Petra took over the operations. The distillery offers five different brands of whisky. Award-winning distillery from the Bavarian Forest. On Destillata 2011, Liebl earned Silver and three times Gold for their Coillmór Bavarian Single Malt Whisky (Gold: Port Single-cask 46%, American Oak 43%, French Oak & Sherry Single-Cask 46%; Silver: Sherry Single-Cask 46%). The Hammerschmiede (in English: trip hammer) is a small whisky manufacturer founded 1985 in Zorge (Harz Mountains/Lower-Saxony) in the middle of Germany. The Single Malt which is distilled in the Hammerschmiede matures in different casks, like sherry-, marsala- or madeira-casks. The old warehouse of the Hammerschmiede was built between 1250 and 1270 in a late romanic - early gothic style. About 200 Casks are in stock today. The last release was a single pale-cream-sherry cask with 45.9%vol. matured more than 4 years. The Höhler Distillery was founded in 1895 as a maker of fruit brandies. The present owner is a fourth generation member of the family, Holger Höhler. In 2001 he started turning out small batches of whisky using a recipe consisting of corn, wheat and rye. These whiskies are aged for a three-year period and when bottled sell out quickly. The whiskies produced have been in the style of Irish, Scotch single malt, rye and bourbon. The whiskies are spelled "Whesskey" as a play on the word whisky and Hesse, the state in which the distillery is located. The mash for this whisky is produced in the Rothaus State Brewery of Baden (Badische Staatsbrauerei Rothaus AG) in the heart of the Black Forest (Schwarzwald). The brewery was founded on the site of a Benedictine monastery in 1791. The mash is then transferred to Karlsruhe, to the distillery Kammer-Kirsch GmbH for distillation. The distillery was founded in 1909 as the test distillery for the state of Baden, with the primary objective of producing a high quality cherry schnaps. The whisky is distilled twice and stored mainly in bourbon casks with some finishing for special bottlings. The main batches are released yearly on 16 March - the birthday of the Rothaus master brewer, Max Sachs. Distillery Kammer received the award „Germany’s Best Whisky Distillery 2011“, „Germany’s Best Whisky Distillery 2012“ and a silver medal at the IWSC 2013 for the product. 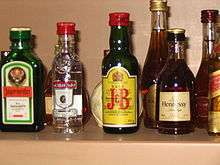 Rabel Berghof in Owen produces many fruit brandies. Several years ago, they started the production of a single grain whisky using wheat, known as Schwäbischer Whisky (Swabian Whisky). The Slyrs Distillery was founded in 1999. It produces Slyrs Bavarian Single Malt. This whisky is aged for three years in new, unused American white oak barrels with a 50-gallon capacity. Beginning in 2015 the company will be offering a 12 year old single malt. ↑ Murray, Jim (2009). Jim Murray's Whisky Bible 2010. Dram Good Books Ltd. pp. 333–336. ISBN 978-0-9554729-4-7. ↑ "Owen Single Grain Whisky". Family Thomas Rabel. Retrieved 21 March 2013. Sharp, David (21 January 2012). "Single minded". Herald Scotland. Retrieved 26 May 2014. Stein, Swantje (25 January 2011). "Eastern Germany's single malt whisky turning heads". Reuters. Retrieved 26 May 2014.